Forrest Monroe picks up his envelope during match day at the University of Colorado on March 15, 2013. Forrest Monroe, holding his baby boy, picks up his envelope during match day at the University of Colorado on March 15, 2013. Inside each envelope is the name of the program and city where medical students will do their medical residencies. If you’re a medical student or recently became a doctor, no need to read further. I’ll be describing one of the most stressful and pivotal moments of your professional life, and you probably already know the gory details. For the rest of you, know this: Your future doctor could be among the more than 34,000 medical students whose fate is about to be handed over to an algorithm. Over the past couple of months, medical students have been interviewing for residency positions at hospitals around the country. But unlike traditional job interviews, there’s no offer at the end of these meetings. 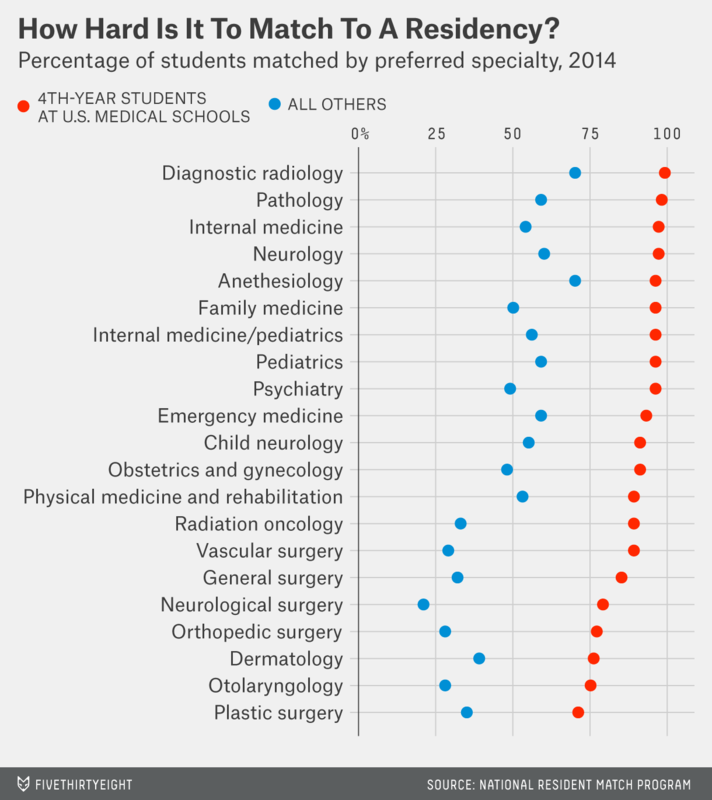 Med students and hospitals are currently ranking their top choices from these interviews. These lists will be sent to the National Resident Matching Program (NRMP), for a process known as the Match.1 The rankings get dumped into an algorithm, which determines where the students will do their residencies — three to seven years or more of supervised training, usually in a hospital. Since you can’t get a license to practice medicine in the United States without completing a residency, this is a high-stakes game. The algorithm is based on the work of Lloyd Shapley and David Gale, American mathematicians and economists known for their contributions to game theory. Although it has many applications (it’s currently used to find recipients for organ donations, and to assign high school students to schools in Boston and New York), it’s easiest to explain using an example from the paper Shapley and Gale published in 1962: how to happily marry off everyone in a community (albeit one that’s made up of equal numbers of women and men who all want to be in heteronormative relationships). It works like this: Each of the women proposes to her first-choice man, and he rejects or accepts. Women still without a partner approach their second-choice man (the women can propose to men who have already accepted an offer, and the men can choose to reject an initial proposal if a better offer comes along). This continues until there are no women left who want to propose to a man. When the algorithm is applied to medicine, students and residency programs replace women and men. Instead of marriage proposals, we have students applying to residencies. Before the NRMP Match, which was founded by students, residency positions were filled with a hodgepodge of methods. Sometimes that meant early offers (to students in their first years of medical school, before a hospital could know their qualifications or what specialization they might choose, and leading to swift replies from students who didn’t know what their other offers might be), and sometimes it meant students rejected hospitals’ offers so late it was hard to find suitable replacement candidates, among other challenges. The Match offered a more coherent and fair process. There were, however, a couple of problems with the initial Match algorithm. First, it couldn’t accommodate med student couples who wanted to be placed together. Residencies often involve relocating, and always involve working long hours; many couples were choosing to try and find positions outside the Match. Second, the program originally had the hospitals doing the proposing, giving their preferences a slight edge over students’. By 1997, the NRMP had updated the algorithm to address both these issues. Mona Signer, president and CEO of the organization, told me that changing who did the proposing had little effect on the outcome of the Match, but has been important for students’ perceptions. And while the algorithm has been good at getting medical students into residency programs, the entire process is not without its problems. It’s understandable that students would worry the Match has become more competitive, and spend thousands of dollars interviewing at dozens of places as a result. More than 20,000 students graduating from U.S. medical schools and an additional 10,000 to 15,000 foreign medical students and U.S. students studying at medical schools abroad are vying for spots in residency programs this year. Signer says students should be honest with themselves about how competitive they are and target applications at specialties and programs they are likely to get into. The annual “Charting Outcomes” report provides detailed information on how competitive different types of residencies are. The American Association of Medical Colleges (AAMC) has been sounding alarm bells for years that there won’t be enough residency positions for all the doctors graduating from U.S. schools. As the demand for doctors grows with the Medicare rolls and the influx of new patients under the Affordable Care Act, they’ve increased the number of matriculants by nearly 30 percent since 2006. The majority of residency programs are at least partially funded by a provision of Medicare, and that funding has been capped since 1997. Several bills have been introduced to raise the limits over the years, but none has made it through the chokehold of Congress. Instead, the funding has taken hits from provisions in the Affordable Care Act and budget cuts during the recession. According to Atul Grover, the AAMC’s chief public policy officer, the number of residencies is growing at a slower rate than the number of people enrolling in med school. He says he’s not sure when those two points will meet, but the smaller ratio of U.S. medical graduates to residency positions is scary for graduating seniors, and likely driving up the number of interviews they feel they need to be competitive. It’s unclear whether Grover is right. So far, a crisis hasn’t hit. Teaching hospitals have increased some funding for residency programs, and positions have opened up in rural and critical-need areas that aren’t subject to the cap. Signer cautioned that, for the moment, there are plenty of residency spots to go around, at least for graduating U.S. seniors. She doesn’t see that changing anytime soon, and says the most important thing for students is to look at the data, and to be realistic about their options. There are other residency matching programs and certain positions are filled outside of a match system, but NRMP is by far the largest system, listing more than 26,000 of the approximately 27,800 residency positions available, according to the American Association of Medical Colleges. Shapley and Alvin Roth, an economist who helped adapt the algorithm to medical school matches and other programs, won the Nobel Prize for economics for their work. More about the Gale-Shapley algorithm and its history can be found on the Nobel Prize page. And the high match rate likely was no consolation for the 526 graduating seniors who didn’t get a residency in 2013, since many of these students are hundreds of thousands of dollars in debt. Since there’s only a chance of a match if both student and program list one another, this is a proxy for the number of interviews that students are going on, though there is a possibility the actual number of interviews is lower than the number of schools ranked.